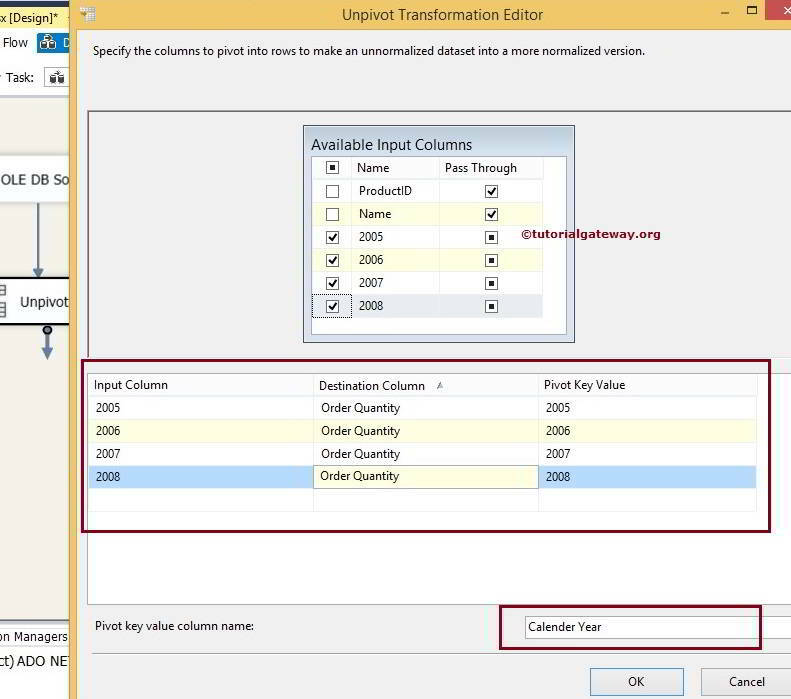 The UNPIVOT Transformation in SSIS is used to convert the DE Normalized data into more normalized version, which is similar to SQL UNPIVOT. UNPIVOT Transformation acts exactly opposite to Pivot Transformation. 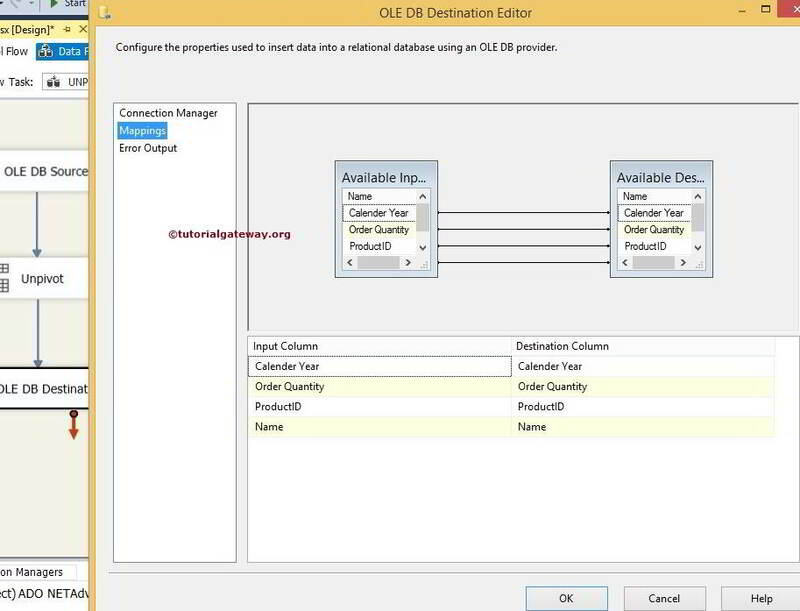 Please refer Pivot Transformation in SSIS article to understand, How to Convert Normalized data to DE Normalized data. In this example We are going to convert the Pivot table present in the Employees database into normal table. Double click on it and it will open the data flow tab. 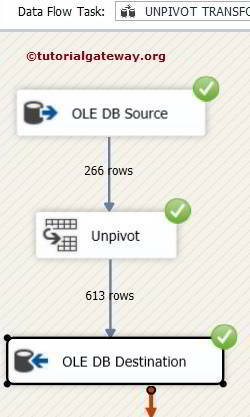 STEP 2: Drag and drop OLE DB Source, UNPIVOT Transformation from toolbox to data flow region as show in the figure. STEP 4: Click on columns tab to verify the columns. In this tab we can uncheck the unwanted columns also. 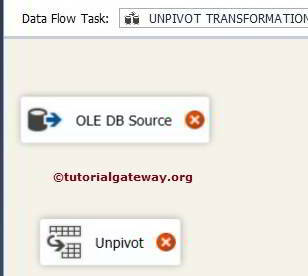 Click ok and drag the blue arrow from the OLE DB Source to UNPIVOT Transformation to perform transformations on the source data. 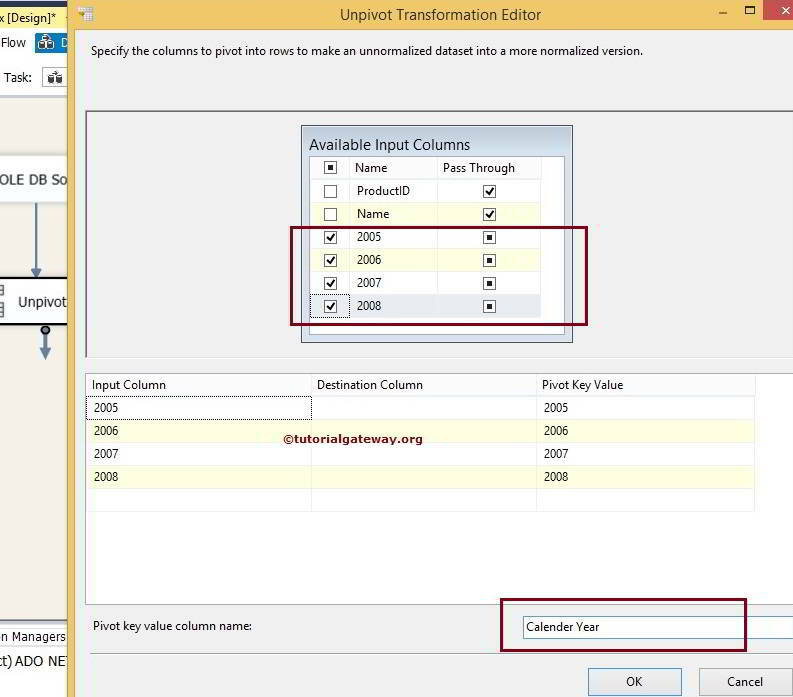 STEP 5: Double click on the UNPIVOT Transformation to configure it. Available Input Columns: Select the columns you want to UNPIVOT by checking the check boxes. Don’t forget to select the Pass Through option for the remaining columns. If you miss to select the Pass Through option then those columns will not be available for the destination. 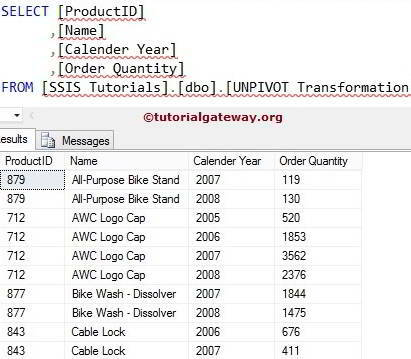 In this example ProductID and Name columns are Pass Through columns and 2005, 2006, 2007, 2008 are the columns we want to UNPIVOT. 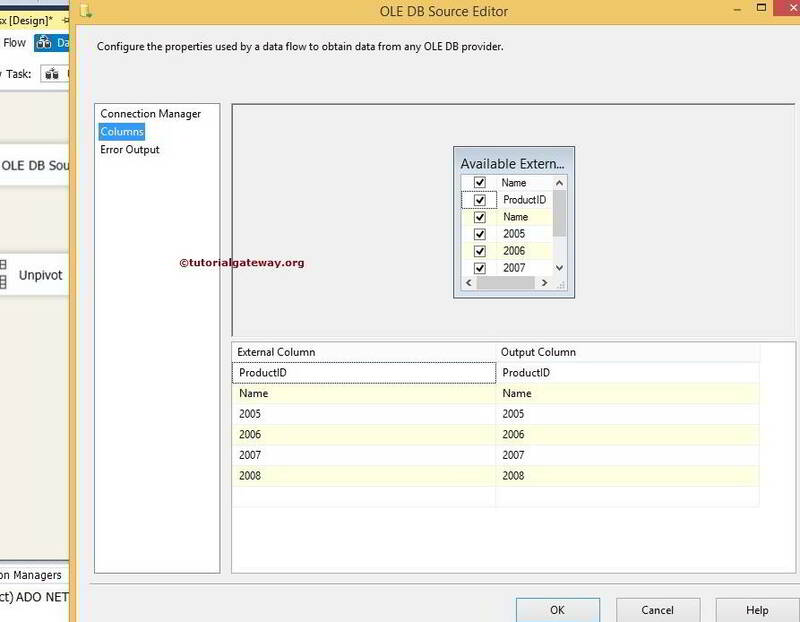 Destination Column: Specify the name of the destination column where you want to store the values or data inside the Input Columns such as 2005, 2006, 2007, 2008. Pivot Key Value: Specify the name for pivot value and these values will be stored as column values inside the Calendar Year column (Pivot Key Value Column Name). The default value is same as input column however, you can change as you like. We are fine with the values 2005, 2006, 2007, 2008 so we haven’t changed these values. Pivot Key Value Column Name: Specify the name you wish to see for the pivot value column. Since our column data is 2005, 2006, 2007 and 2008 we changed the default Pivot Key Value to Calendar Year. 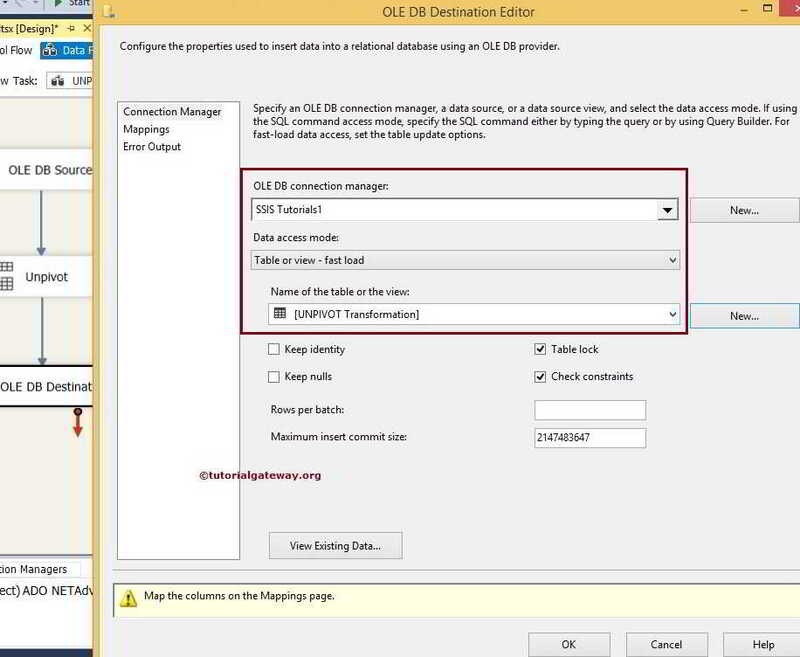 STEP 6: Now we have to provide Server, database and table details of the destination. 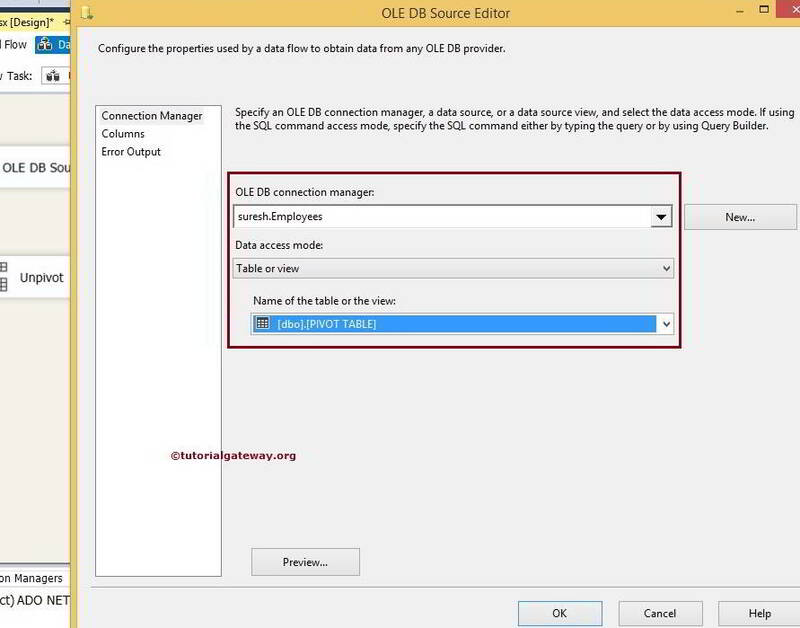 So double-click on the OLE DB Destination and provide the required information. 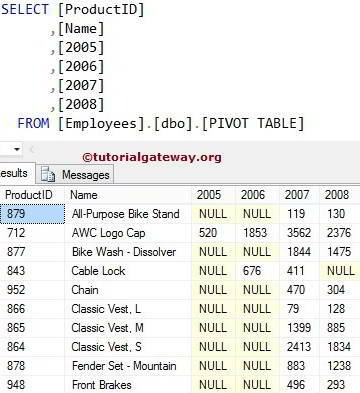 Here we selected [SSIS Tutorials] database as our destination database and [UNPIVOT Transformation] table as our destination table. STEP 8: Click on Mappings tab to check whether the source columns are exactly mapped to the destination columns.